Released through iTunes U, the new series consists of six starter guides recently published by Apple Education, the company's in-house edtech team. Apple advertised the collection's launch in an email sent out to iTunes U users, and is featuring in the Education section of the iBooks Store. "We're excited to announce a new collection of guidebooks designed to help educators learn how to use iPad in the classroom," Apple said. 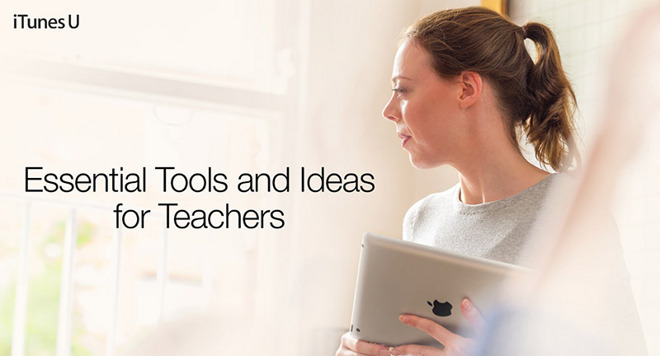 "The iPad guide helps educators get the most out of iPad for their daily work and lessons. The Apple apps guides include step-by-step instructions to build a sample project and master basic and intermediate skills in each app." As Apple is positioning the informational e-books as an extension of its iPad in Education initiative, the series includes an iPad Starter Guide for teachers new to the tablet or those unfamiliar with in-class deployments. The remaining books detail the educational potential of Apple's first-party iOS apps and include iMovie for iOS, Pages for iOS, GarageBand for iOS and Numbers for iOS. Certain titles have been available for some time, as the Keynote guidebook was first published last year. Each starter guide is free to download now from the iBooks Store. Apple products has long been a staple of many public and private educational institutions, though the company faces stiff competition from the likes of Microsoft and Google. Cash-strapped educators looking for less expensive edtech solutions, as well as those who find tablet unsuitable for classroom use, are driving a shift away from iPad and toward hardware like Chromebook. Apple has boosted software resources in a bid to stem losses. For example, the company in March launched a new Classroom app for deploying, managing and monitoring iPads in classroom settings.